Obsidian is a superior gemstone formed as lava from volcanic eruption cools within the earth. Rarely, obsidian has an iridescent or metallic "sheen" caused by light reflecting from minute inclusions of mineral crystals, rock debris or gas. These coloured specimens are known as "rainbow obsidian. Pure Obsidian is usually dark in appearance and can be found in various kinds where gemologists considered Rainbow Obsidian the most esteemed Obsidian. Rainbow Obsidian is black Obsidian and when it gets polished, shows the bands of rainbow colours and exposed a strong light and it has the unique feature of having gentle bubbles of air caught within it the protective body of the glass. Obsidian is a naturally occurring volcanic glass formed as an extrusive igneous rock. It was admired by ancient cultures because it’s appearance as a flint that could be crumbled to produce sharp edges for arrows and spears. In prehistoric era it was used for making tools, weapons and mirrors but in Mexico it was used to form images of their God Tezcatlipoca named as ‘Shining Mirror’. This subtle gemstone can be found in any place where volcanic activity has occurred. South America and Japan are the important sources of Obsidian. In addition to this Rainbow Obsidian is the official state mineral of the United States of Georgia. Rainbow Obsidian shows a beautiful band of colours. Sometime it shows the full spectrum which is the result of natural chemical process. The rainbow colours swirled through it come from finely distributed water bubbles. This appealing gemstone generally appears in green to dark brown and black and can be also seen in sheen of gold, yellow or purple correlation. It is mostly noted for its shining concentric band. 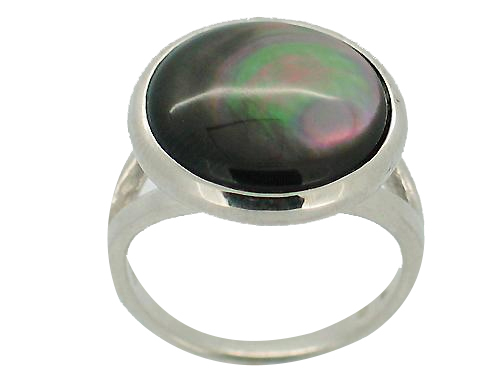 Rainbow Obsidian is usually called as a ‘Stone of Pleasure’ that brings light and love to one’s life. This gemstone is peculiarly powerful in meditation to dissipate shock and fear and it is an excellent grounding stone linked to Root Chakra which provides a connection from the base of one spine to the heart of the earth. It works as a shield against negativity and helps to reduce stress levels and aid recovery from depression This wonderful gemstone is said to be used by Nostradamus to anticipate future events but it is commonly used for ornamental purposes as a gemstone which possesses a peculiar property of presenting a different appearance according to the manner in which it is carved. Rainbow Obsidian comes with black and other sheen rings and it can be found in vitreous and translucent lustre with the hardness of 5 to 5.5 on Moh’s scale. Price of this wonderful gemstone can be varied according to its accessible physical appearance and the value of this gemstone could be raised two to three times from the normal rate due to its rarity.